In listening to the radio and television performances that comprise this release, one does not see Miranda's wild getups, her famed hats or her dancing. The most famous Brazilian performer in the United States during the 1940s, Carmen Miranda became famous for the outlandish hats she wore which contained bananas and other fruit and for her elevated shoes. However, she was a talented singer and a fine all-round entertainer who was a big name in Brazil long before she came to the U.S.
Born Mario do Carmo Miranda da Cunha on Feb. 9, 1909, she was actually originally from Portugal although her family moved to Rio de Janeiro when she was two. After having odd jobs (including one making hats), her singing career started in 1929 when she began performing tangos on local radio stations. The following year she was signed to a record contract by the Victor label. Her third record, Pra Voce Gostar De Mim, sold 36,000, copies which at the time held the distinction for the most sales in Brazil of any record. 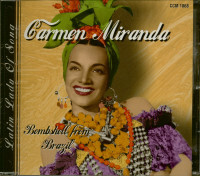 Throughout the 1930s, the renamed Carmen Miranda worked regularly on stage, on the radio and the recording studio, appearing in five Brazilian films. In 1939 she came to the United States for the first time, appearing in the Broadway play The Streets Of Paris. Soon the attractive performer was signed by Twentieth Century-Fox to appear in a series of musicals. She added an exotic element to the films, usually being much more colorful than the bigger-name stars. Her first American movie, Down Argentine Way, was a hit and made her into a household name. 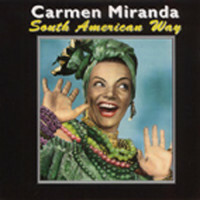 Although Carmen Miranda's movie roles were sometimes a bit of a caricature with her wearing outrageous costumes and the memorable fruit hats, her singing and entertaining abilities shone through in such musicals as That Night In Rio, Weekend In Havana, Springtime In The Rockies, The Gang's All Here, Greenwich Village and Something For The Boys. By 1945, she was the highest paid female in the U.S. and was instantly recognizable After the end of World War II., there was less interest in Latin samba music but Carmen Miranda retained her fame. Among her later movies were Doll Face, If I'm Lucky, Copacabana, A Date With Judy, Nancy Goes To Rio and 1953's Scared Stiff. She continued performing on the radio, in nightclubs and on records. 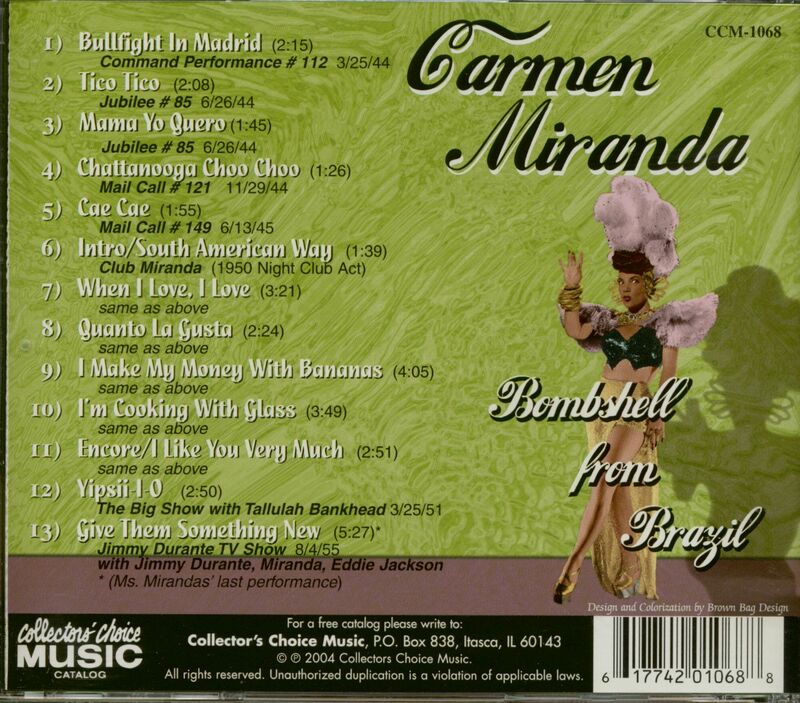 Customer evaluation for "Bombshell From Brazil (CD)"